Cooking fudge is a snap with this no-fail microwave recipe and your help. 1. Line 8-inch square pan with foil, with ends of foil extending over sides. 2. Microwave chocolate and milk in microwaveable bowl on HIGH 2 to 3 min. or until chocolate is almost melted, stirring after 2 min. 3. Stir until chocolate is melted, using pot holders on hot bowl. Blend in vanilla. Stir in extra ingredient, if using. 4. Spread fudge into prepared pan. With adult help, top hot fudge with 25 cookies, peanuts or marshmallows arranged in 5 rows of 5 each, if desired. Refrigerate 2 hours or until fudge is firm. 5. Use foil handles to lift fudge from pan. Cut into squares, using the 5 rows of 5 toppers as a guide. 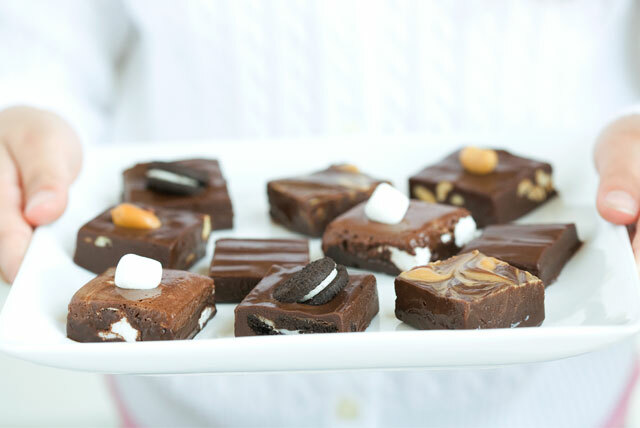 Cookie fudge: Measure 1 1⁄2 cups (about 37) Mini Oreo Cookies. Reserve 25 cookies for topping. Cut remaining cookies in half. Prepare fudge as directed, adding halved cookies with vanilla. Peanut fudge: Measure 1 cup Planters Cocktail Peanuts. Reserve 25 peanuts for topping. Prepare fudge as directed, adding remaining peanuts with vanilla. Marshmallow fudge: Measure 2 cups Jet-Puffed Miniature Marshmallows. Reserve 25 marshmallows for topping. Prepare fudge as directed, adding remaining marshmallows with vanilla. Peanut butter fudge: Prepare fudge as directed, immediately dropping 1⁄2 cup peanut butter by teaspoonfuls over fudge after spreading into prepared pan. Cut through peanut butter with knife several times for marble effect.